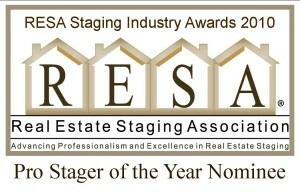 It is such an honor to have been nominated for RESA’s 2010 Industry Award for Professional Stager of the Year. As president of Ingenuity & Pizzazz, Inc. I have been a home stager for over six years, and it has been quite a journey for all of us who got started in “the beginning.” It has been exciting to witness the growth of the home staging industry and the continuing elevation of professional standards. Christine Rae, president of Certified Staging Professionals, deserves much of the credit for continually raising the bar in the training of new stagers and in establishing a Code of Conduct for all CSPs – the gold standard of the highest professional ethics. The leading staging training company in North America, Certified Staging Professionals offers the best value hands-on training experience and incomparable curriculum, resources and after-training support. Our CSPs are truly staging professionals. Ingenuity & Pizzazz, Inc. is a full service staging company, specializing in staging to sell, staging to live and staging training. We have collaborated with agents and sellers on the staging and marketing of over $500 million in real estate and pride ourselves on the high quality of our showcasing expertise and our incomparable customer service. Our clients call us magicians and miracle workers. The magic and miracles happen because of our talent, professional training, extensive experience and high standards. fastest delivery. Generally speaking, you get what you pay for. For most sellers, their home is their number one financial asset. sell faster and for more money than comparables that are not staged. decorating – it is marketing, pure and simple. only way that type of product will sell is at a significant discount! property in the shortest amount of time. the CSP home staging training program is the best investment budding home stagers can make in themselves and their businesses. I am extremely proud of being a trainer for this exemplary organization and am pleased to share my diverse experience and expertise with all my trainees. I am looking forward to my upcoming home staging training classes in New York City (Oct. 17-19) and Ottawa (Nov. 2-4). For more information, please visit www.csptraining.com and IngenuityPizzazz.com or contact Nairn Friemann at nairn@IngenuityPizzazz.com. Train with the industry leaders and add professional staging services to your business. Certified Staging Professionals offers the most comprehensive, hands-on staging training program available and unparalleled after-training support. Founded in 2005, by internationally acclaimed staging expert, Christine Rae, CSP delivers the best value in staging training in the industry. As president of Ingenuity & Pizzazz, Inc., one of New York City’s top staging companies, I have collaborated with agents and home sellers on the staging and marketing of over $500 million in real estate in the Tri-State area. As a trainer for CSP, I share my diverse experience and expertise with all my trainees. Don’t see your city on our list of scheduled classes? We will come to you for a minimum of 6 trainees. You name your date and location. We’ll do the traveling! Register 30 days in advance and receive a DVD package from Ann Maurice, TV’s House Doctor and international staging expert. A special value of $200. Last but not least, is our extraordinary Second Chance Offer for the remainder of our 2009 classes. For anyone who has invested in another staging training program but who would like to upgrade to the CSP training and designation, we will include the CSP exclusive Fast Track Package with the basic investment level. To qualify, proof of former training will be required and registration must be made by the end of October 2009.